Baccarat, signed. 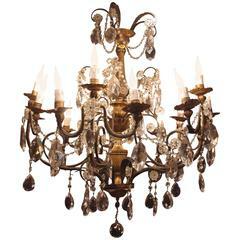 Large Louis XV style cage chandelier with 18 fires on two levels with a curved shaped gilt brass structure. Crystal cache-bélière (hide-hook) in a shape of a large twisted gadroons cup supported by a gilt brass circular ring on which baroque shaped crystal tassels are hung. Central shaft constituted with a gilt brass stick and all covered by cut crystal with many bulges. S shaped arm lights topped by a gilt brass cup with twisted gadroons motifs and a fluted bobeche with a foliage decor. Ornamentation of crystal tassels in form of leaf, rosette and decorative dagger on gilt brass supports. 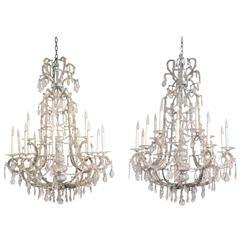 Chandelier finishing by an crystal ball cut oval facets. Work realized circa 1950. Original and functional electric system. - Louis XV style - 5 branches and 15 lights - 2 patinas bronze: gilt and natural - Made for European electricity, we can rewire for the U.S on request. Silvered bronze Pearls around the branches Pampilles Ten branches and twenty lights Louis XV style 1920 period Made for electricity.